Socialization gives dogs the ability to exist in their most natural state: in the company of other dogs. At DePAW, we believe that daycare provides your dog with more than just an outlet for excess energy and a way to get healthy exercise during the day. Daycare provides socialization with other dogs and may lower a dog’s stress level which can often reduce or eliminate many behavioral problems. Socialization is very important for dogs; not just with other people, or other dogs that may live in your home, but with many dogs with a variety of personalities. To add mental stimulation to the mix, we will provide enrichment activities such as pools (weather permitting) and bubbles which will help in making your dog a well-rounded pet. For most dogs, it’s more than just playtime, it’s a time to be a dog with other dogs which is incredibly rewarding for them! In order to ensure the best possible care for our guests, we require our daycare attendants to not only have experience before we hire them, but they must continue to complete 100’s of hours inside our daycare rooms, complete CPR/Pet Saver training, take video training, and complete a series of written and oral tests to move up our leveling system of care and types of dogs they are allowed to supervise. We also regularly provide staff members with outside educational opportunities facilitated by respected professionals from around the country to keep their skills current. We do all we can to ensure the safety of your pet, from temperament testing every dog, selecting the appropriate play group for your dog, managing social space your dog while acclimating to the group, to constantly monitoring the general activity and excitement level of the entire group. No daycare room is ever left unattended at any time, ever, period. However, similar to a children’s daycare, there are risks during play time. 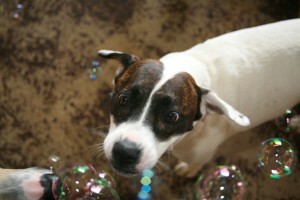 Dogs can be very playful and exuberant and they use their mouths like hands and their teeth like fingers. Accidents can and do happen. 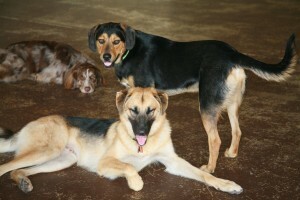 This is a risk our guests assume when allowing their dog to participate in group daycare. A dog may get a scrape, cut, sprain, or even an occasional puncture during friendly play or when the the play becomes not so friendly. We pride ourselves on our excellent reputation for handling such situations with quick responses. Our rating of being the #1 Kennel in the community for so many years is reflective of this. Ask us about our “leveling” system when you come in for a visit! We also offer “puppy babysitting” for dogs under 4 months, and day-boarding for dogs who prefer not to spend time in one of our play groups. Click here to see inside our large side Daycare. 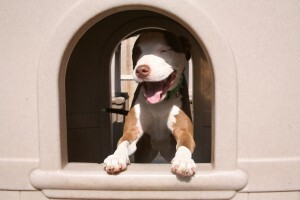 You can also check our FB page for posted videos of our furry clients playing and interacting!